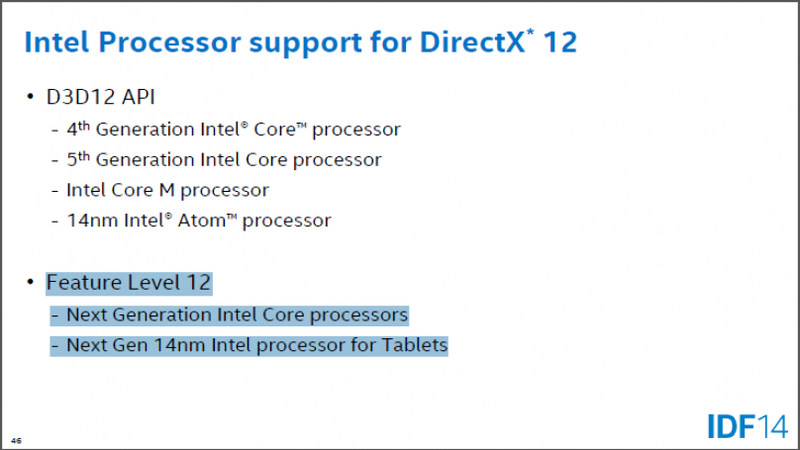 A few days ago I wrote about a leak which stated that Skylake-S will have DX12 support. However, we were not sure whether it was just DX12 API that was supported or the full hardware level feature set. As it turns out, it is the latter as Intel has officially confirmed the same in its IDF 14 keynote. This would also make the upcoming Intel processors the first chips to have confirmed full DX12 support. DX12 needs no introduction, thanks to social media and online publications it is one of the most eagerly anticipated APIs after Mantle. However, even though we have seen demos, tech charts and more, we have yet to see a hardware chip that supports the ‘Feature Level 12_0’ set. Many thought that the upcoming GPUs from Nvidia and Maxwell would be the first to do so, but we still have a few days to go before release and Intel has already swooped in and taken this particular honor. Intel’s Skylake-S processors are one of the first confirmed chips to support the full and uncut DirectX 12. I am 90% sure that Nvidia Maxwell will support the full feature set too, but until its confirmed, it doesn’t count. You will ofcourse be seeing the DirectX12 tag on a lot of devices but that only indicates support for DX12 API. The actual Direct3D Feature Level 12_0 is what we are after. GPUs/Devices which do not have hardware-level support of DX12 will have Feature Level 11_0, Feature Level 11_1 and Feature Level 11_2 at most. If you take a look at the slide shared by Intel on IDF14 above you will notice that Intel mentions “Next Generation Intel Core Processors” which means Skylake and beyond. It also mentions “Next Gen 14nm Intel Processor for tablets. Which is something we have suspected for quite some time now. Recall the DX12 demo at SIGGRAPH that showed a massive 60% boost for mobile devices. Since a Mobile Platform is always working with power and thermal constraints, both the CPU and GPU share a TDP Budget if you may, so any lack of power consumption by one can either be utilized in a zero sum or result in a decreased TDP rate. This makes a low level API of critical import to the mobile sector. Most importantly however, this was a very big hint to the press that Microsoft is going to be shaping DX12 for the tablet sector as well. There wasn’t a lot of technical information in this update, but it does tell us that Microsoft seems to have learned from the debacle that was DX10 and is trying to push DX12 non-exclusively into everything and anything it can manage. The OS however, is another story altogether and I won’t be surprised if DX12 is Win 9 only.